What if you could say goodbye to the days where you need to break the bank to get a finishing job on your concrete? Well, with the right products and right knowledge, you could save literally thousands of dollars. So we set out to educate and provide the tools you need to make that floor look like you want it to. With the Concrete Polishing System, you pick what you need for your specific project, order exactly the right quantity of exactly the right product you need and then get step by step instructions on how to apply it. Contractors, business owners, homeowners, whoever you are, you’ll get a straightforward way to get the job done. There are 5 products you can apply to you Concrete Polishing System. Satellite pads are required to get the Concrete Surface Profile needed to get the sheen you want. Luckily, we provide the package pre-built with the grits you will need to get the CSP necessary for your polish job. Polishing Guard is an ultra small particle protective coating used for the grind and polishing of concrete as a stain guard. 1 Gallon of this product will cover between 1000 to 3000 square feet. Comes in 1 Gallon quantity. Denisifer is a penetrating, reactive treatment for all concrete surfaces. When polishing concrete, we use it to react with excess lime in the concrete surface to produce a permanent, hard calcium silicate deposit in the pours making it stronger, more durable, and stain resistant. 1 Gallon covers between 300-500 square feet, and comes in 1 gallon quantities. 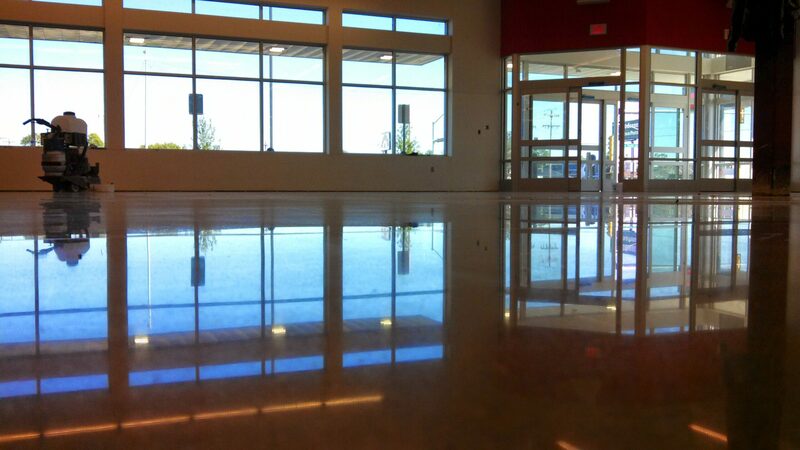 Polishing dyes can be applied to any polished concrete surface prior to the final polishing. They will penetrate evenly and deeply to allow the final polishing to be done without loss of stain color. Polishing dyes provide a wide pallet of acetone or alcohol soluble dyes for coloring polished concrete for all interior application. There are four steps to this entire process. You can download the PDF and print off these same instructions here. 3. DO NOT skip grits. 4. Squeegee dirty water off the floor between grits before it has time to dry. Note: It is best to let densifier dry overnight to further harden the floor. And if you are applying color wait to dye and densify after 400-Grit. following order. These pads should be ran wet. 1. Apply Concrete DNA™ Polishing Guard by spraying it on the floor and spreading it with a microfiber. Apply at least 1 thin coat. 2. After your floor is dry and cannot be marked by touching, buff with a Concrete DNA Double Sided 3000 Series Pad. In addition to the step by step instructions, use the videos below to make sure you get the finish you want the first time you go through. Polishing jobs are relative to the job, and no two jobs are the same! Use the information provided above to select the products you need, then select “Add To Cart” and get everything you need for a polishing job shipped to your front door. Pad Diameter Choose an option14"16"20"27"
Select from 7 different colors. QUANTITY GUIDELINES: you will need 1 tube per 1000 square feet (approximately).